In this three part series, we introduced the Option Greeks in the first post. In the second post, we discussed the practical Application of Option Greeks with respect to options trading. In this concluding post, we will understand the usage of an option calculator. An option calculator is a tool which helps you calculate the Greeks, i.e., the delta, gamma, theta, vega, and rho of an option. Along with the calculation of the option Greeks, the option calculator can also be used to calculate the theoretical price of an option (also called fair value of an option’s premium) and the implied volatility of the underlying. The option calculator uses a mathematical formula called the Black-Scholes options pricing formula, also popularly called the ‘Black-Scholes Option Pricing Model’. This is probably the most revered valuation model in Economics, so much so that its publishers (Robert C. Metron and Myron Scholes) received a Nobel Prize in Economics in 1997. Inputs include: Spot price, Interest rate, Dividend, and the number of days to expiry. Along with these mandatory inputs, we also input either the price of the option or the implied volatility of the underlying, but not both. Spot Price – This is the price at which the underlying is trading. Note, we can even replace the spot price by the futures price. We use the futures price when the option contract is based on futures as its underlying. Usually, commodity and in some cases currency options are based on futures. 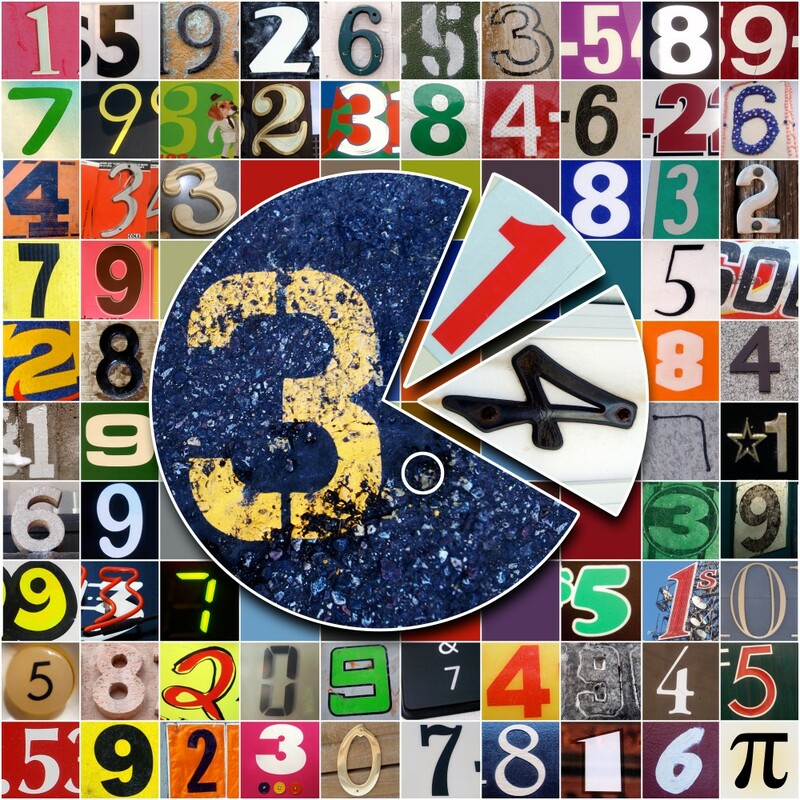 For equity option contacts, always use the spot price. Interest Rate – This is the risk-free rate prevailing in the economy. Use the RBI 91 day Treasury bill rate for this purpose. As of September 2014, the prevailing rate is 8.6038% per annum. Dividend – This is the dividend expected per share in the stock, provided the stock goes ex-dividend within the expiry period. For example, today is September 11 and you wish to calculate the option Greeks for the ICICI Bank option contract. Assume ICICI Bank is going ex-dividend on September 18 with a dividend of Rs. 4. The expiry for September series is September 25. In this situation you need to give an input of Rs. 4. Number of days to expiry – This the number of calendar days left to expiry. If you wish to calculate the theoretical option price as one of the desired outputs, then volatility has to be one of the inputs. For Nifty option contracts, use the India VIX index value. Alternatively, if you have a view on volatility from today to expiry, you can input that as well. You can do the same thing for stocks. Option Price, also called the ‘Actual Market Value’ – If you wish to calculate the implied volatility of the underlying you need to input actual market value data. The actual market data is simply the price at which the option is trading in the market. Once these inputs are fed to Black-Scholes option pricing model, the model churns out the math to give us the required output. The logic on which Black-Scholes model works is quant heavy involving concepts of stochastic calculus. For a quick introduction on the working of a Black-Scholes model, I’d encourage you to watch this video. Along with the Greeks, the output includes either the implied volatility of the underlying or the theoretical option price. Keeping the above framework in perspective, let us explore the Option Calculator on Zerodha Trader (ZT). To invoke the option calculator, click Tools –> Option Calculator as shown below. Or you can simply place your cursor on an option scrip and use the shortcut key Shift+O. The top section highlighted in blue is used to select the option contract, this is fairly straightforward. The left section highlighted in red is the input field. Let us look into this. We begin by selecting either the ‘Underlying’ or the ‘Futures’ price. I’d suggest you select ‘underlying’ as the default option. Once the underlying has been selected, you need to manually enter the value of the underlying in the ‘Spot Price (in Rupees)’ field. The next two input fields are ‘Actual Market Value’ and ‘Volatility %’. At this stage you need to decide what the option calculator should calculate for you. If you want to calculate the ‘fair value of the option premium’ also called the ‘Theoretical Option Price’ then leave the ‘Actual Market Value’ field blank and proceed to enter the volatility data. 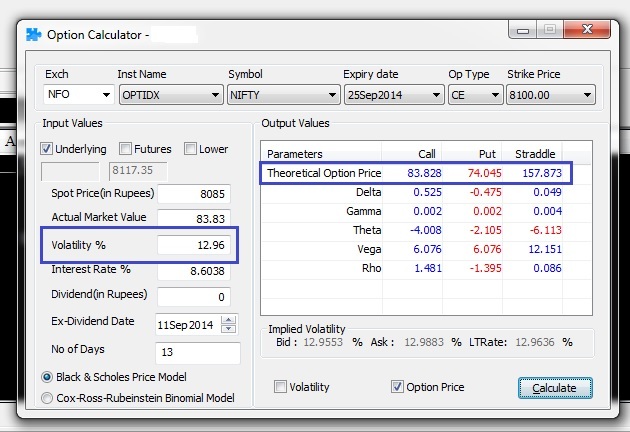 As I mentioned earlier, for Nifty options use the India VIX index value for the ‘volatility %’ field. Alternatively, if you want to calculate the volatility of the underlying leave the ‘Volatility %’ blank, but make sure you input the market price of the option in ‘Actual Market Value’. For the ‘interest rate %’, take the 91 day T-bill rate data from the RBI website. ‘Dividends (in Rupees)’ would be for the index and the actual dividend value in case of a stock. Also, in case dividends are expected within the expiry of the contract, make sure you enter the ex-dividend date. The last input field is the number of days left to expiry. Input the total number of calendar days here. Note, Zerodha Trader (ZT) has two models based on which the Greeks can be calculated, i.e., Black-Scholes Pricing Model and another model called the ‘Cox-Ross-Rubinstein Binomial Method’. The binomial method is also popularly used, however, I’d advocate the Black-Scholes model as it is more advanced and precise. It is worth mentioning that the difference in output values between the two models is not really much. 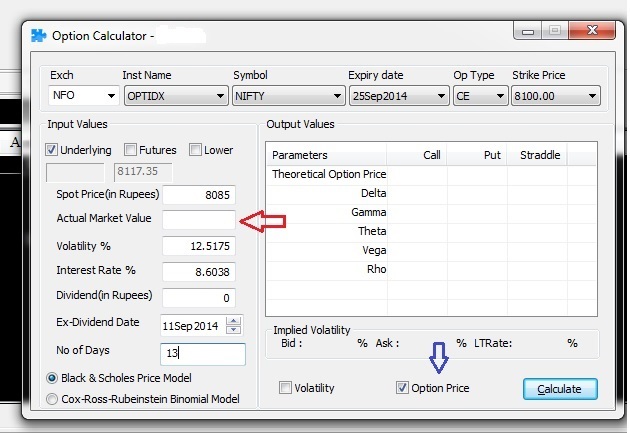 Select Volatility if you want the option calculator to calculate the volatility for you. If you want to calculate the theoretical option price, select the ‘Option Price’. Along with the Greeks, I intend to calculate the Option price (highlighted in blue). Also ‘Actual Market Value’ is left blank (highlighted in red). I’ve taken the volatility value from the India VIX index. The dividend field is blank since I have selected 8100 Nifty Call option ( index option), hence the value in ex-dividend date field is irrelevant. The first field in the output field is the theoretical option price (also called the fair value) of the call and put option. The calculator is suggesting the fair value of 8100 call option should be 81.14 and the fair value of 8100 put option is 71.35. However, the call option value as seen on the NSE option chain is 83.85. The difference, though not significant, mainly occurs due to factors such as wrong volatility assumptions, bid-ask spread, liquidity, transaction charges, and taxes. Following the theoretical option price you can find the data on Greek values. As of today Nifty spot is 8085, and the closest ATM option is 8100. As we had discussed in the previous post, the ATM option should have a delta of approximately 0.5. In fact, the calculator is telling us that the delta is 0.525 for the call option and -0.475 for the put option. This is in line with our discussion on delta in the previous post. Following the delta value we find other Greek values such as Gamma, Theta, Vega, and Rho. 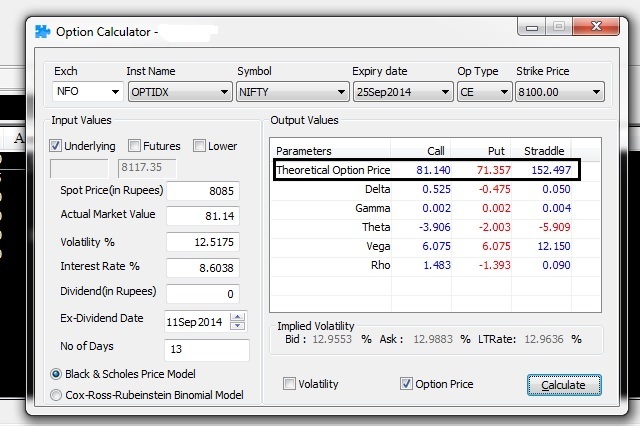 Let us now use the option calculator to calculate the volatility of the underlying. To do this, I leave the ‘Volatility %’ field blank (highlighted in blue) and select “Volatility” (highlighted in red) option. Further, I input the “Actual Market Value” of the 8100 Call option as observed on NSE, which in this case happens to be 83.85 (see the NSE Quote image above). Option calculators are mainly used to calculate the option Greeks, volatility of the underlying, and the theoretical option price. Sometimes small differences arise owing to variations in input assumptions. Hence for this reason, it is good to have room for the inevitable modeling errors. However, by and large, the option calculators are fairly accurate. Lastly, we hope you enjoyed this three-part series on Option Greeks. Please introduce this in the web based trading platform. Can we get live option geeks columns along with option chains like delta, gamma . I just double checked on version 3.11.2 and it seems to work fine. Are you sure you are giving the right inputs? Very useful post and I m learning a lot. I m trying to utilize the calculator in zerodha trader but nothing calculated. I m using 3.11.2 version and spoke to zerodha customer care, one guy said that currently issue is going on so it wont be working temporarily. Please clarify when will it get up. The Option Calculator on Zerodha Trader usually works, but there may have been some update issue which is causing this. We’ll look into it and have it updated soon. Have sent you and email requesting you for your contact details. I’ll be happy to help you through this. Can you please uninstall and re install ZT? Please write to linekar at zerodha dot com, he will assist you in this regard. Thanks. Thank you for your time and detailed explanation. The values calculated from the zerodha calculator do not match the market values of the options. The calculated prices are comparatively inflated using the formula. 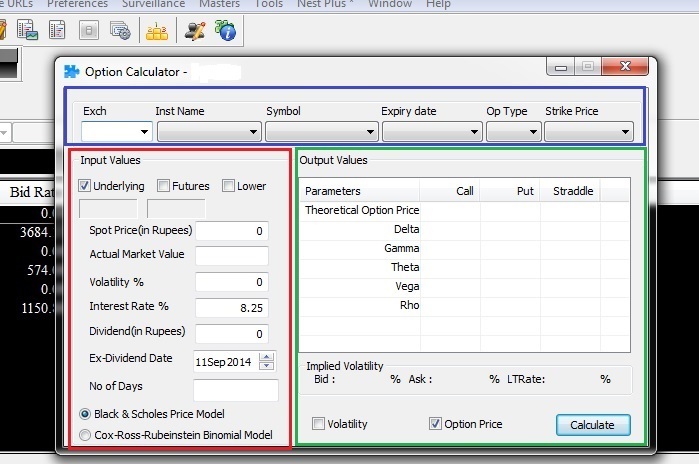 Sonu, all options calculator built on the logic of B&S Option Pricing model works the same. See the image below, I have given the same input and I got the same result as in Zerodha Trader. Please do let me know if you have queries. Kindly request you to check for Nifty or BankNifty the difference becomes much bigger on both the calculators. 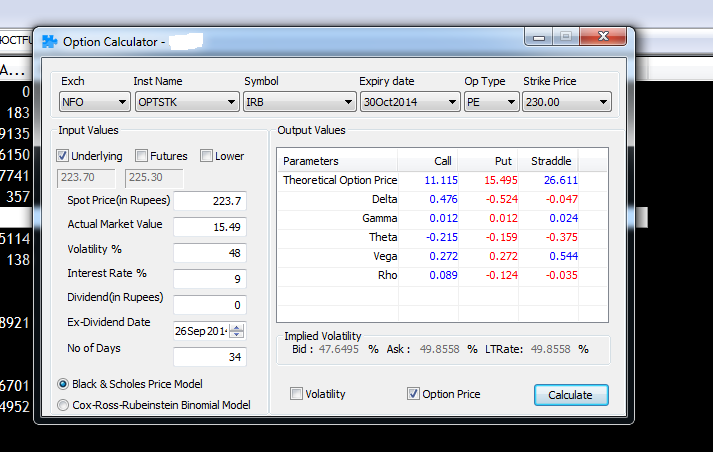 Sonu, as i mentioned before if the Option Calculator is built on B&S logic, there is no way the values could differ. Please see the image below, I have calculated the values for Nifty 8000 CE (I have used dummy data) on both ZT and your source. They match up. Good Article and a very useful tool. Thanks Sonu for sharing the link. Is there any other variable for option. I think Beta is there. If so please throw some light. No Sir, no other inputs required apart from the variables we have discussed above. Values that I am struck are Risk Free Rate and Dividend. Checked the RBI Link that was posted above for Risk Free….however would not find the value. Request you to provide link where in I can see Risk Free Interest Values. Do we have to change the Risk free rate every month. 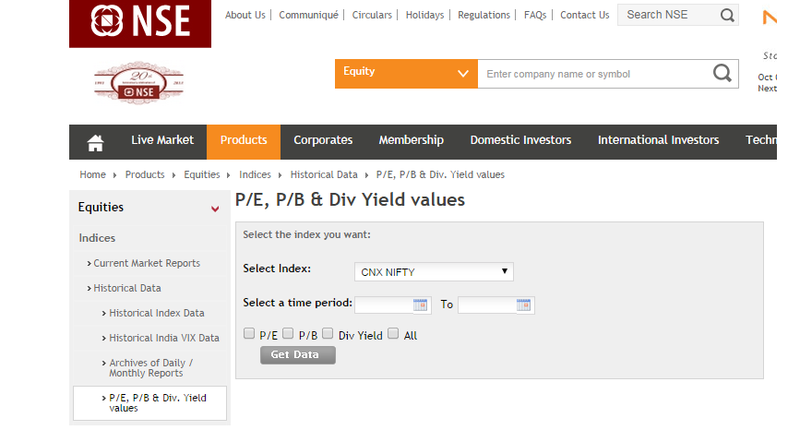 Where can I find Dividend Value for Particular stock – eg – Infy – does it change every month. I have an excel incorporated with BS Model – If the IV is 42 or 43 in Nse – my xl says 47. is this right? I also see Dividend value plays important role in IV value. Please explain? For individual stocks, you need to keep track on their corporate announcements. Suggest you try moneycontrol for the same. Yes, Dividends do play an important role, you need to include the dividend amount and the ex divided date in the calculator. It would be a bit tricky for Nifty Options as Nifty is an Index and quantifying the effect of dividend is quite difficult. The difficulty is basically because of the issue arising out of tracking dividend across 50 companies and the ‘time & Price’ effect on options. For this reason I personally prefer to set the dividend value to zero. However for stock specific options, this should be simple. Will the option calculator work only during the Trading hours? I checked now in Web Login, (the Opt Calc link what you have shown in the picture above). It says No data as result. We have calculators to get delta of options. What about futures? Just wanted to know – is it safe to assume that the Delta for a futures contract is always 1? Yes, the delta of a Futures Instrument can be assumed to be 1. One more question – I see that the delta of a put is always much lower than the call at the same strike price. Usually the delta of a put is half that of a call option. Is there anything wrong in my calculation or is this how it is meant to be? Is there any reason for such disparity in delta of call and put options? The delta of an ATM Call and Put should be more or less equal. However the deltas vary as and when the spot moves. On a related note, you may also want to check on the put call parity of options. hi plz make some video on options it will be use full for new option traders. I gave the required parameters for BNF option. Nothing happens when I click button. The inputs seems to be fine. I’m not sure why it is not responding. I have fwd your query a colleague of mine, you should get a response soon. Before we figure out why the option calculator is not working for you, we need to understand if you’re doing a few things right. Firstly, you need to ensure you’re using the latest version of Zerodha Trader which is 3.11.2, you can download this from our Downloads page. After this is done, you should be able to see the right Greek values on your option calculator. Please check the attached file. All settings are as per your instructions. But still it is not working. Could this be the reason. If yes, please tell me as how to fix it. Why is the tools-> implied volatility always showing zero. I was trading actively only on NSE F&O till now and now want to try commodities too. I’m in the process of getting my commodity account activated at Zerodha. Meanwhile i want to know is there both Futures & Options in commodities or only Futures? What is the margin requirement in commodities trading? How different or Similar is commodities trading from the normal NSE F&O traing? Sukesh, only futures in commodities trading. Margin requirements are quite less as compared to equity future contracts. Check this and this. Commodity markets are open from 10am to 11.55pm, and this post should help you figure the rupee impact for 1 point movement in a commodity. Thanks for the quick response. Is there any reason/logic for this weird timings of commodity markets? Commodities trade internationally, even though by the time Indian markets open at 10 am most of asia has already opened. MCX keeps the non agri contracts (agri contracts trade only till 5pm) open till the closing of the US markets (Comex, IST – 11.30pm in summer and 11.55pm in winter). This lets the Indian trader react to news that can affect his position for most part of the day. where do i can find historical values of IV for Stock & Nifty options ? The Zerodha Trader application works fine on a computer which is connected directly to the internet. But if a computer system is connected to the internet via a proxy server it failed to work. I had a first hand experience on this. Can you resolve this problem? This should help you use ZT without a problem. if I put zero what will be the ex-dividend date? hi, option calculator is not working on trade.zerodha.com. whenever i use it to calculate the price of option it shows no data.help me regarding this,. It is said that if IV is more than historical volatility, one can prefer buying that option. Can you please explain with a practical example and sources to find the historical volatility. 1. Option calc doesn’t work. Why does this happen even if i input all values correctly ? 2. When pricing options using B&S model for Nifty index, should i input the Nifty Underlying price or Nifty Current Month’s Future price? 3. Also can i hedge a stock by buying the futures of that stock instead of the underlying? 1. Option calc doesn’t work (online as well as Z trader0. Why does this happen even if i input all values correctly ? 3. Also can i hedge a stock option by buying/selling the futures of that stock instead of the underlying? I am getting no data when I enter values in option calc through website. Is the functionality in place or do I need to check only through nest . Let me know if anything need to be provided from my end. Sunil here. I m using Pi. Is there any other way I can calculate the Greeks ? If I login to ZT, Pi gets logged off. I want to know if there is a way I can calculate the Greeks, by being logged in to Pi. Any other site that I could use? I have a query about the Options Calculator. I trade in Nifty Options. I had read the article on Options Greek.What I understood from the article is that , in the volatility box, the India VIX value needs to be entered whereas in the Interest box, the 91 day RBI T-Bill Interest rate needs to be entered and the Dividend can be kept as zero. Please correct me if I’m wrong. I want to know from where I can get the latest 91 day T Bill rate. I tried searching for it but can’t get a clear result. Could you please give the link for the same. Suni – You are right on the inputs. For T bill rates goto https://www.rbi.org.in/, on the landing page left hand side you can see “Current Rates”, under that click on the Money Trends…here you can see the 91-Day T-bill rates. As usual, you were quick in resolving my query. Keep up the good work. You rock….!!!! 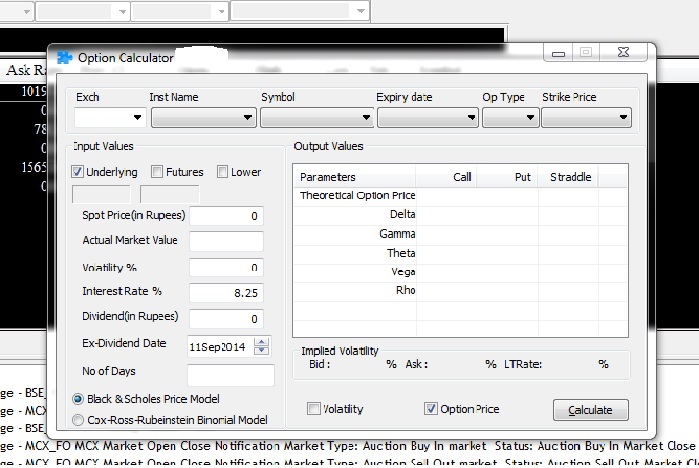 If the actual option price is less than the theoretical option price calculated as per B&S calculator. Can I buy the option assuming that the actual price will increase to its theoretical option price in sometime ? Yes, this is the general idea behind estimating the theoretical option price. Also remember the B&S option pricing model, is just a model – the quality of the output depends upon the quality of the input. So before you take the trade, double check to make sure your assumptions are clean. 1) Calender days means that we will include Saturday , Sunday and all the public holidays? 2) Total bid qty represents demand, total ask quantity represents supply. So what does volume tell? Volume part is clear. Just read your chapter. I have been suggested by a colleague who is an Option Trader not to use the interest rate% to calculate fair value of calls and puts for Stocks and Indices. It should be used only for currency trading. Is that true? can you please help clear my doubts on that? Not true. Interest rate is a key input variable in Black & Scholes option pricing model, and one must feed in a relevant value to get the fair price of the option, irrespective of the asset (equity, commodities or forex). Are there any plans to add this feature to kite? That would be very nice. Can you mention what feature you are talking about? While using the options calculator do we also count the weekends and non-trading days or should we exclude those days? For example, today is 11 April, so we have 17 days to expiry. But due to holidays and weekends, we have only 10 Trading days. So, should I input 17 or 10 as the number of days? I guess its best to include only the trading days. In this case it would be 10. I have set the greek variables on my market watch (Nest-Trader) but the values are not being updated while live trading. It all showing just 0.00. What can be the reason ? You didn’t tell if this is calls or puts. In case of calls, 100 calls will have no value if stock closes at 90 on expiry day. your profit the entire 2.5 or Rs 2500. What’s is a short call. I’m new I’m option treading. where i can see premium when buying nifty future call option in PI ?. You need to add the option contract on the marketwatch. Can you check this video. i saw this video is very very useful for me but my problem is what the currently premium running in the market. example : – i have already added CE/PE options of nifty 50 from NSE >> OPTIDX and i’m watching only LTP, strike price …, etc but not even a single place where i can find premium which is charged by company currently. i have already read about options. may be sir, i’m not understand options but as for my knowledge is concern by the grace of zerodha varsity, options CE is buy when bullish is happen, example when i decide that share’s price is increase from my buying price(strike price) call option is made money for me and i will pay only premium. otherwise we use put option is made money for me and only pay premium. CE/PE – limited loss and unlimited profit (only premium paid to the seller by me or buyer). but sir my problem is where i can see actual the premium of that share currently which i want to buy call and put option because premium is increase/decrease time to time. You can add that option to the marketwatch. For example search for Reliance 1000 strike price CE on Kite, you can add it to watchlist. i buy only index(nifty50 and Bank Nifty) . i told you, i have already added CE/PE using your powerful desktop app “PI”. let me convey you first what i have added to my market watch list and how. 1) select NFO from drop down menu. 2) later on select OPTIDX of nifty 50 .
i know LTP – 10.8 is premium but it is Last traded price(premium), i want what is actual premium of nifty 50 index currently. Now i’m pressing F6 to showing snap quote, not showing premium of nifty50. my question is very simple where i can see the actual premium of nifty 50 which is currently running in the market?. here how i can attach screen shot of my market watch list to more convenient. 🙂 LTP is what you can trade on. The actual premium, if you mean the theoretical price of an option, you can use the option calculator. You could use this https://zerodha.com/tools/black-scholes. But note that theoretical price and actual price could vary. You can speak to someone on 080-40402020.
i use kite, & use B&S calculator tool from zerodha. now that the web page is changed, i couldn’t find the calculator. please help me find it. thanks. It is listed under resources –> tools. Check this – https://zerodha.com/resources , request you to check this page by end of day. Thanks. Some issues, we will get it in sometime. Hello Sir, How does these Greeks calculation make a difference in choosing call or put option can you please elaborate with example? i mean based on the info we have that is Gamma,Delta, Theta,Vega,Rho how to decide which option to buy or sell? Request you to check the same. Thanks. Can we make a statement that we have used correct values of Time, Interest Rate and Annual Volatility during our B&S calculations when the sum of delta (Call+Put) of an ATM strike is ‘0’ or close to zero? The delta of call and put are kind of mutually exclusive, no point adding up to derive any sort of information from it. However, mathematically the sum of call delta + put delta of an ATM strike is expected to be close to zero. I had this question as NSE under it’s option chain (for Nifty) assumes 10% interest rate which is not real, as RBI 91 days is around 6.52%. Hence, all IV on NSE website were not matching with B&S calculations assuming RBI’s risk-free rate. Since Annual Volatility and Interest Rate are the only 2 variables not readily available from the market (Time, Price, Strike, Dividend are fixed & actual), i wanted to conclude whether NSE’s computation is correct or computation with RBI rate is correct. Hence, the question, how do we know our theoretical values are correct and matching the real time market data! I get your point, and I’m really not sure why there is a interest rate differential. Maybe we will check with NSE directly to understand their logic. However, it makes sense to adopt NSE’s interest rate values as the entire market relies upon this data. This query is regarding calculation of theoretical value of options. First, What should go as IV in B&S formula ? On the NSE’s website, the IV figures are published for each strike in call/put option. For eg. 8600 call option shows an IV of 12.61 while the 8600 put options shows an IV of 15.44. NSE’s India VIX, as on date, is quoting at 14.8875. What IV should one use, if one were to derive the theoretical option value at any strike price ? Second, NSE’s IV calculations are done assuming an interest rate of 10% (as claimed on the website). Should we, then, base our B&S calculations on RBI’s Treasury Bill rates(91 days) or on NSE’s interest rate figures ? 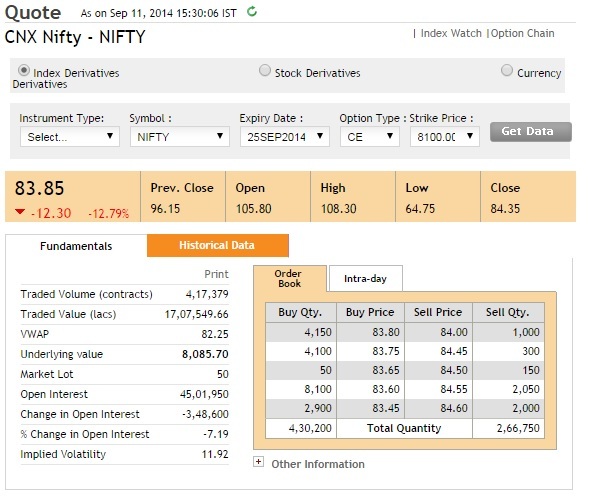 NSE takes an interest rate of 10% while computing the implied volatility – scroll down to the end of the page and you see the interest % mentioned by NSE. 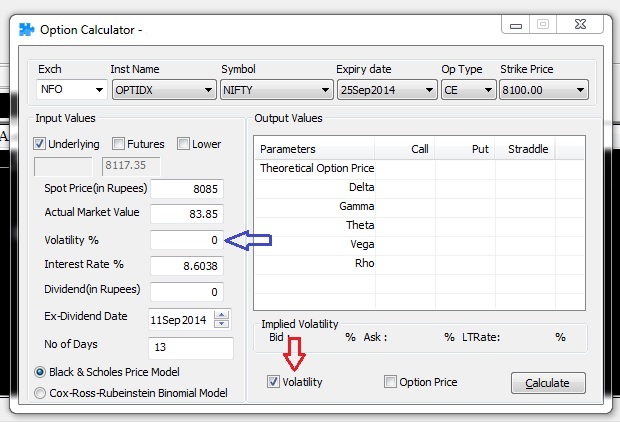 You can also see and IV column in the option chain – this gives you strike specific implied volatility. Few Queries which I haven’t found an answer to. 2) It makes sense to use NSE’s 10% rate. Can a person buy 100000 shares in options without much effort. How can I buy 1 lakh shares at one click there is no basket order option in PI OR KITE AND NEST IS NOT WORKING PROPERLY.so how would I place order for 1 lakh share in just one click. If you aren’t using NEST to place the orders, you’ll have to place multiple orders. Where can I get a lambda calculator for easy calculating the percentage change in option of each strike for a percentage change in underlying? Got it. Not sure of any reliable online calculators for this. But I guess you could use a simple excel model to build this yourself. Lambda incorporates both the delta factor and the gearing factor and if such a calculator is available it will be much useful in developing mathematical models to trade. If you are building a mathematical model, then its best if you build this piece yourself. Will be more reliable and custom tuned to your model’s exact requirement. Can you tell me the fair value of M&M 1360 CE on 24/03/17 if M&M price is quoting at 1360. Taking all the values as per current trend. Assuming a 25% volatility, and the spot to be around 1360, then 1360CE would trade at Rs.20.15/-. You can use the B&S calculator to calculate the IV %. Enter the regular parameters like time to expiry, strike price, spot price etc. Along with all these, you also enter the current market price of the price for this particular strike. Hit calculate and you will get the IV value in %. Is there any excel based B&S options calculator available which can calculate the prices on real time? Nothing that I’m aware of, you can look it up on the internet. Thanks for your modules on options, it changed lot of my views. what is effect of weekend( i mean holidays) on theta. as no of days to expiry will be 4 that time. So, will the option premium reduce on opening of market on Monday assuming volatility remains same. I had done some analysis . If i select 28th as expiry, all the values are very much accurate, but expiry is on 27th. I have checked with different calculators also. You can choose the expiry date on the calculator. The markets do factor in the weekends as well whilst deciding the option premium ; may not carry the same weightage that traded days carry. There’s a module on Varsity discussing theta: http://zerodha.com/varsity/chapter/theta/. Can we have a new button for real-time option Greeks alongside buy, sell, market depth, chart buttons in the Kite. It will help the options traders to see the real time option Greeks and prepare their strategy accordingly. On our list to do. When I try to buy BANKNIFTY06JUL1723200PE @1.8 my order gets rejected giving reason “Option strike price based on LTP percentage for entity account across exchange across segment across product”. What does that mean and why does it show this reason ? Aniket, Deep out of the money options on Bank nifty weekly can sometimes be blocked if hitting open interest limit on exchange. I have some basic questions which are inter related. 1. How can you make profit by “exercising” an option instead of squaring off the position ? How do you exercise an option ? 2. In Indian context, does exercising an option only means holding “In the money” (ITM) option till expiry. Is there any other meaning of “exercising” an option apart from the former ? 3. What is options roll over ? Is it something different than squaring off your position for current series and taking same position in next month series ? 1. All options in INdia get exercised automatically. But everything settled as cash. 3. It is squaring off current and taking next month. Will this tool available in Zerodha Kite? Inputting the data into Zeroda BS option pricing formula with Nifty yesterday underlying close at 10210.85 for a strike of 10300 call with expiry as 26/10/2017, 15 30 hrs ,current day AV as 12.26 and RBI 91day treasury bill yield as 6.07 outputs to 38.58 as the call option price.But if the same is input to as 24/10/2017 as expiry dates shaving of the 2 day trading holiday ,option call price reflects to 27.81(settlement price is 28.45). Diwali trading hour would compensate to that.So my question is , Is not imputing calendar days give distorted results in option pricing. It would be appreciated if in the expiry column the default time is set as 15.30 hrs instead of 23.59 hrs. Not trade in zerodha option trading ? Yes, you can trade options in Zerodha. If F&O has not been enabled in your account you will have to submit your income proof. You can submit one of these docs as income proof – form-16, IT acknowledgement copy, 6-month Bank statement, Stock Holding Statement, or the CA certifying your networth. You can send it to [email protected]. 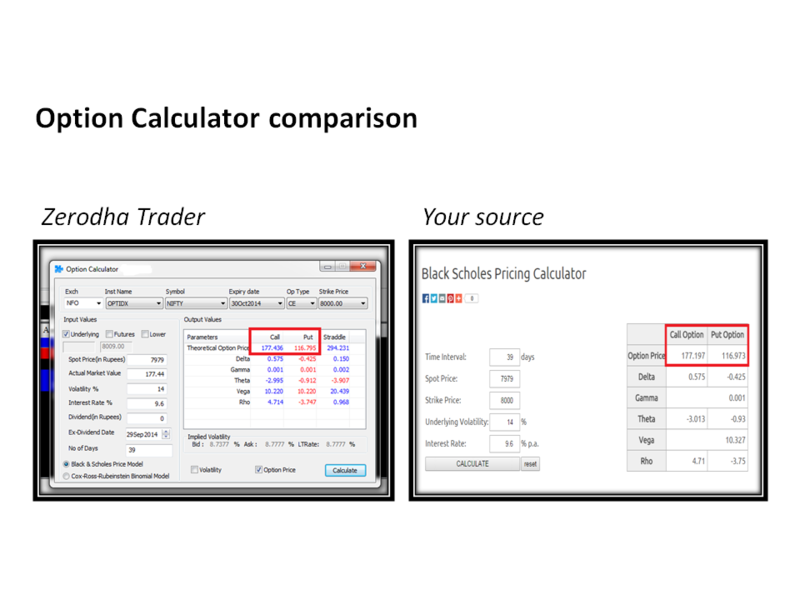 Can you please tell, the way described to calculate Volatility, can we use this volatility in the black schole calculator as Implied Volatility to calculate option price? Kiran, this feature isn’t present on Kite currently but is on our list of things to do. I am looking to understand how to compare implied volatility (IV) with historical volatility. Can you please suggest how to do this? Also can you clarify whether the historical volatility is derived from historical IV data or a standard deviation of underlying? I had 10667 cash balance . Today I bought 10700 nifty pe at 49.8 premium and sold it at 51.8, thereby making a profit of Rs 150, which is showing green coloured 150 correctly. But my funds show (Free Cash 10665.5), (Margin Used -150) and (Total Value 10515.5). I believe the total value should be 10665.5 + 150 instead of 10665.5 – 150. So it should be 10665.5 + 150 = 10815.5 But it is showing as if I made a loss of Rs 150. Total value = Free cash – margin used. So it’s 10665.5 – (-150) = 10665.5 + 150. Hey Sridhar, check out the Varsity module on Options.